You can read some Auden here. He wrote a Christmas cycle. Who knew? Then may you "put aside all earthly cares." After all, they'll be back soon enough. Global Warming? Screw the Polar Bears! My jaded and jaundiced view of the endless campaign was epitomized in a post listing 10 activities preferable to following the dreary rituals of our overripe demi-democracy. It might as well have been inflated by an order of magnitude and included making paper snowflakes and igniting farts. Others, such is the inimitable and briefly hiatal Larison, as well as the paid handicappers, have more than made up for my reticence on the subject. If this is a blog that started out mostly political, I suppose, as one who rips the bandaid off quickly, it is time to divagate on the would be POTUSes. I will leave out the purely quixotic efforts, such as those of poor Mike Gravel, Chris Dodd, and Slow Joe Biden, not to speak of Dennis Kucinich, the Evil Elf. Tancredo and Brownback have spared themselves being flogged by my wisdom by dropping out. Dodd and Slow Joe, although sadly mistaken about everything except what shoes to wear, do deserve better. In a parliamentary system, they'd be ministers, if not prime. So, here goes. A general note--candidates' positions tell us something about them, but how many of them have already shown a tendency to tergiversation, and how many Presidents in the past did the exact opposite of what they promised during the campaign. Hence, character and biography are as important as stated positions. Hillary. The late Leonid Breznev used to mangle speeches about tractor production and Marxist dogma to the "loud and stormy" applause of ten thousand sycophants. Whenever I see this lady, my thoughts turn to the mouldering and decidedly non-meteoric Leonid. She's earnest and dull. In mitigation, she's dogged and disciplined. When she brought her carpetbag to New York state, she slogged through every apple-knocking corner of the state. I suspect she reads the briefing books and did her assigned reading in American History, which puts her head and shoulders over Chimphitler and much of the competition. Although some believe she's a secret Bolshie fanatic, others on the Left think she's a sellout only a couple of degrees to port of the simian incumbent and prepared to say anything at all to get elected. Certainly she can be imperious (as in Travelgate), and the Clintons are dangerous to their friends. Obama. I confess I don't know what the shouting is about. Obama's a mulatto who talks nice and for the nonce has given up pounding the racial drums. He gives a coherent speech, and has virtually no experience relevant to the office. He says stupid things, such as expressing a willingness to talk to hostile heads of state without preparation and being willing to send troops into Pakistan without permission. The country is Oprahfied enough as it is. Edwards. Another lightweight on experience. I can overlook his pretty-boy hairdo, which seems to be a trait of a certain kind of Southern Protestant. I can even swallow my annoyance at the thought of another cracker in the White House. If I thought his demagogic populism betokened a bit of nationalism on immigration and trade, and a principled anti-interventionism, I'd be tempted to overlook the likely statist implementation of his populism. It doesn't matter, of course. He can't win the nomination, even if he does win Iowa, which is a slight possibility. He might be smarter than we all think, though. Giuliani. Rudy's still technically the leader. He does seem the smartest of the bunch, and perhaps it's my New York background that makes me sympathize with the guy's style, in spite of myself. And he did stand up to the race hustlers when Mayor, and showed concern about protecting the middle class, and not just the parasitic underclass beloved of the New York Times and other despicable institutions. However, he has two strikes. He's surrounded himself with the likes of the maniacal Norman Podhoretz and thus seems likely to be the most intransigent and aggressive in international affairs, regardless of the wisdom of such a course. Secondly, he's shown himself to be impervious to constitutional and prudential constraints on his power. Perp-walking stockbrokers whose lawyers would have quietly surrendered them betokens a hunger for publicity and power. I have a visceral distaste for abusive prosecutors; Rudy was one. Romney. As some say of Jews, "Some of my best friends are Mormons." Romney, however, sets my teeth on edge and makes my skin crawl. He's not only phony, or at least anachronistic, in manner, but appears to be a tergiversating opportunist. Mitt Headroom. I'd almost prefer Hillary's ponderous Brezhnev imitation to having to listen to this guy for 4 or 8 years. GWB's lateralized /s/ was bad enough. What Hugh Hewitt sees in Romney, I'll never know. Huckabee. The guy's likeable and relaxed, and the GOP Establishment hates him. All of this makes him interesting. However, he's short on experience, unclear on foreign policy, and his closet hasn't been vetted for skeletons. His numbers are starting to decline as the spotlight shines on him. Talk to me in a month if he's still in contention. McCain. I despise campaign finance reform as an attack on free speech, disagree strongly with McCain's stance on immigration, and disliked his support of the deal on judges. However, he's personally brave, smarter than most of the field, and is his own guy, calling things as he sees them, even doubling down on Iraq when others were tip-toeing away. I now think starting the enterprise was a mistake, but unlike some war opponents, I'd like to get out of there with something that might pass for victory. McCain seems to be getting a second wind. Even if he's grouchy, he has a lot more character than the others. And in spite of his views on Iraq, men with military experience, unless they're maniacs, know what war is like, and are less likely to start one just to prove they have cojones. Thompson. Nice guy. Lightweight. He didn't catch fire. He's history. Paul. The man, like many libertarians, comes off as a bit of a crank and has an odd gaggle of supporters, as one expects of any "outsider" candidate. However, he's for small government, he's anti-interventionist, backs off libertarian dogma enough to be tough on immigration, and seems genuinely lacking in the usual vanity of politicos. At least as long as I don't have to confront the possibility of him actually winning, he has my vote. If I actually have to think about the gold standard and the Federal Reserve, I'll have to ponder the man's views more closely. For all his centralizing authoritarianism, looking at our choices, I envy the Russians their Putin. Is Continental Philosophy the new Texas Hold 'em? HT: the otherwise highly dubious JPod. For those who think evangelically. No! It’s Mike the Huckabee. Or is he another Connally? I don’t remember . . .
(With apologies to Monty Python and Eric the Half-a-Bee). 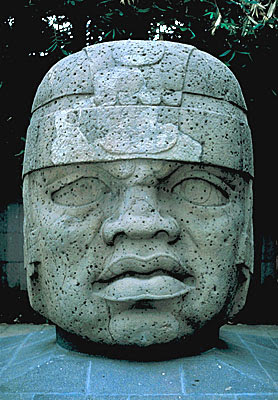 Olmec Head vs. Caudillo head. 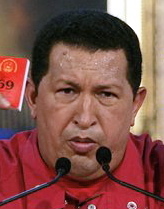 Hugo Chavez, the President of Venezuela, has narrowly lost the constitutional referendum that would have established him potentially as President for life, given him powers to appoint deputies to run local governments, and also institute such measures as a six-hour day. 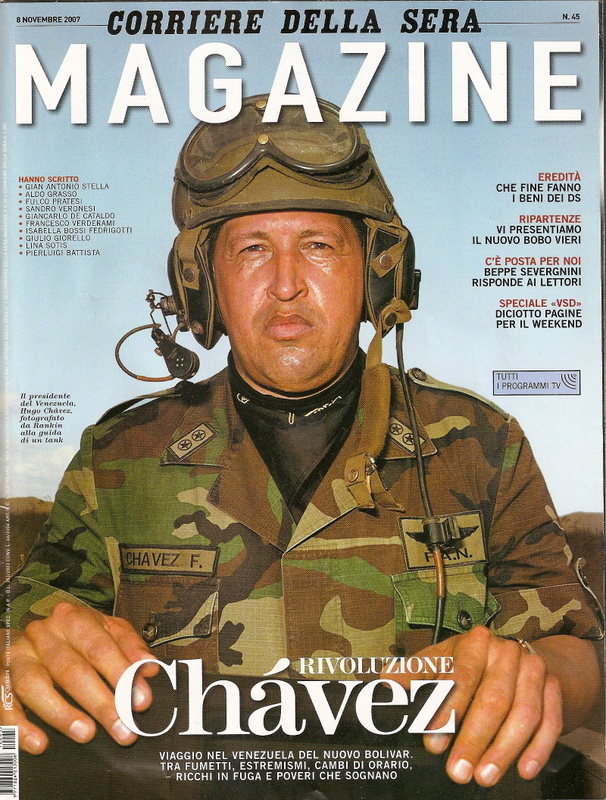 Chavez is frequently viewed by hostile commentators as a "fascist," a potential dictator, and a threat to the US, which he spares no occasions to lambaste, using the US as a foil for his lengthy TV monologues. What sort of dictator, one might ask, subjects himself to an electoral test, and acknowledges defeat in a popular election? 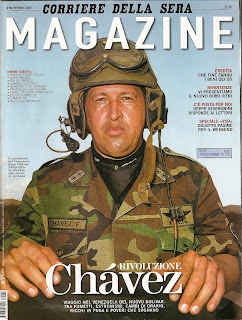 In fact, Chavez is neither some kind of honorary Bolshevik, as certain soi-disant Marxist acolytes claim, nor a fascist, if that term is to mean anything other than "a politician I dislike." He is rather a combination of two Latin American archetypes--the populist caudillo and the autodidact (self-educated) egomaniac. Far from having a coherent political philosophy or program, these types improvise, throwing sops, emotional and financial, to the masses of the poor, while concentrating their own power and spinning out their interminable egomaniacal rants. Many of the Chavez-haters in America, of course, are democratists, who think of that benighted system as the supreme political good. Why Chavez's use of the populist-democratic initiative or plebiscite makes him a fascist, but the waving of purple fingers in Iraq turned that benighted land into a democracy is a question these folks won't answer. The fact is that Chavez is a classic democratic type, much like the unfortunate Roosevelt or the archetypal Huey Long. When there is a mass of poor people or even not-so-poor people with a dependent outlook, tax and tax and tax, spend and spend and spend, elect and elect and elect is a classic and effective strategy. It makes for waste, debt and the undermining of national character, but never mind. It's democracy. For the moment, the Infeliz overreached, Venezuela balked, and rather than cheat, he took a step back.